Worst part of the week? Spending all day yesterday thinking it was Friday and realizing, as I got ready for bed, that I had one. more. day. at work. 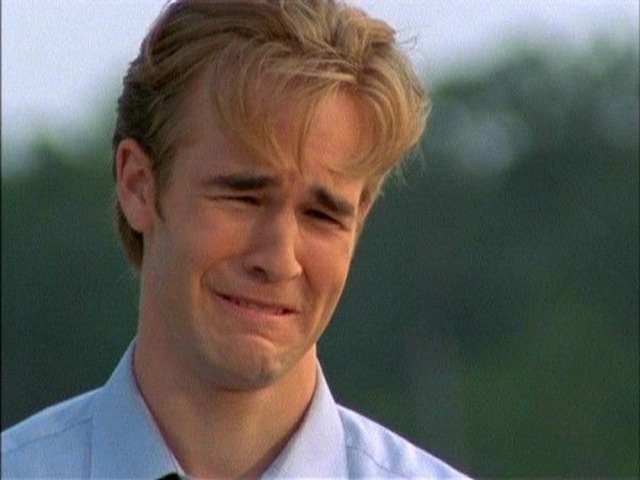 Even the Beek is sad. So, after such a horrible post yesterday, I thought I would post something mindless and superfluous. These are just questions that rattle around my brain, in regards to fashion dos and don’ts. Why are scrunchies so vilified? I missed the memo about why we hate these. Can someone enlighten me, please? I don’t find them offensive. And I’d let to get on board with the hate. Why, in the name all kittens, are designers making t-shirts sheer? I know I have complained about this before, but jeepers! I don’t want to look at others’ bras, not do I expect they want to see mine. I like to wear them to work under a jacket or sweater, with the knowledge that if it gets hot, I can take the top layer off behind the slurpee machine and not be scandalous. No more, it seems. I am all for piercings. Go crazy. I wouldn’t do it personally, but eyebrow, nose, lip, whatev…if it makes you happy, do it. But that stretching thing? Nope. I don’t get it. Pantyhose. I *know* many women look better with them. I *know* that many workplaces require them. But, they are SO. PHUCKING. UNCOMFORTABLE. The nylon does not keep it’s shape. They sag. They pull. They snag. They start making your feet burn if you have to walk any distance. The crotch sags. Le sigh. Who made up the rule about hose? I hate all these trends. I very likely have NO business with this query, but WHAT is up with dressing little girls like slutty, 25 year old women?? When I go to Target (a magical place where nothing bad ever happens) and walk by the “Girls” department and glance at what is currently being offered to young girls as fashion?? Oh Em Gee. Mothers? I’m so sorry for you. My mother would not more allow me to wear some of that garb *in* the house, let alone out in public. And I mean NOW. When I was a kid? (Back in my day…). Pants. Turtlenecks. T-shirts – long, NOT belly shirts. Skirts – knee-length or longer. 163 days ago, I broke my comfort zone. I don’t know what I was thinking of at the time, but it seemed then like a really good idea. 14 days from now, it will be done. My life will be forever changed, for good or bad. I think it will be for good, so that’s how I’m approaching it. I had such high hopes and grand plans to get ready for this. I started a “Couch to 5K” program, since I HATE RUNNING. I knew it would be my least favorite portion, so I thought I would train most on that. Within a month, I had a beautiful squishy lump on my knee and couldn’t run. It was identified as runner’s knee and was followed by 2 months of PT. I will be walking the running portion. I’m getting pretty good at the biking portion. For years, I said I was going to start riding my bike to work, since I live only 7 miles away from the Gas ‘n Sip. This gave me an excuse to actually do it. Of course, I am incredible at coming up with excuses to NOT ride, but so far, I have gotten more use from my bike this summer than I have in the past 10 years. The swimming was the portion I was least worried about. However, putting on a wetsuit? YIKES! I decided that I would deal with it with the same attitude I deal with getting a massage – they have seen bodies FAR better and FAR worse than mine. And after I attended a swim clinic, that is so true! I’m fine. I have 2 weeks to mentally prepare. I’ll get there. And thanks to my extraordinarily generous friends (and some strangers) I have managed to raise almost $750 for breast cancer research. That was the main purpose of signing up. I’m very pleased about that fact. Thank you for your support! I’ll let you know how it goes. Oh, hello! Come on in and have some iced tea. There’s something wrong with me. Mentally. I’m convinced of it. Someone here at the Gas ‘n Sip just invited me to his child’s first birthday party. I almost started crying. This is strange for many reasons. I don’t enjoy children, typically. I don’t enjoy socializing with circus work folks, typically. Thank goat I decided to take this Friday and Monday off. Evidently, I need a nap. Or, you know, a smack in the head.